Ancient Greek Philosophy: From the Presocratics to the Hellenistic Philosophers. Table of Contents. Athens, 5th century BCE. Silver tetradrachm. Athena on the obverse. 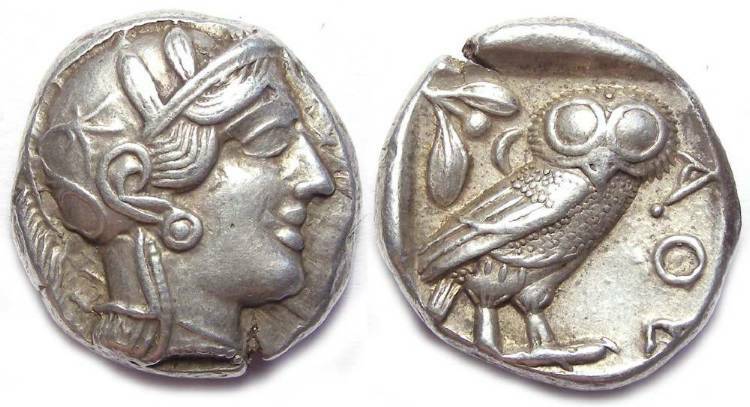 On the reverse, her sacred owl, an olive sprig, and ΑΘΕ for Athens. αὐτὸς καθ᾽ αὑτὸν ἀστρονομεῖν διδάσκεται. "ὁ δὲ ἀνεξέταστος βίος οὐ βιωτὸς ἀνθρώπῳ"